Hello Everyone: Autumn is in full swing now, the trees up here in North West Indiana, have started to turn colors, which is one of the many things I love about this season, plus the weather has been just amazing, so we are enjoying this last days of warmth before Winter rolls along. I have another Christmas card to share with you today, to participate in the Freshly Made Sketches challenge this week, here is my card. The image is from a Power Poppy stamp set called Poinsettia by Marcella Howley, such beautiful images and sentiments on this set. I stamped it onto Canson water color paper and colored with my SU markers in Olive Green, Garden Green, Cherry Cobbler, So Saffron, More Mustard, (the combination of So Saffron and More Mustard allows you to make a beautiful golden tone), Real Red and River Rock, the top of the stocking was colored with my white Prismacolor pencil and shaded with the Black. I cut the banner and fussy cut the bottom of the stocking. 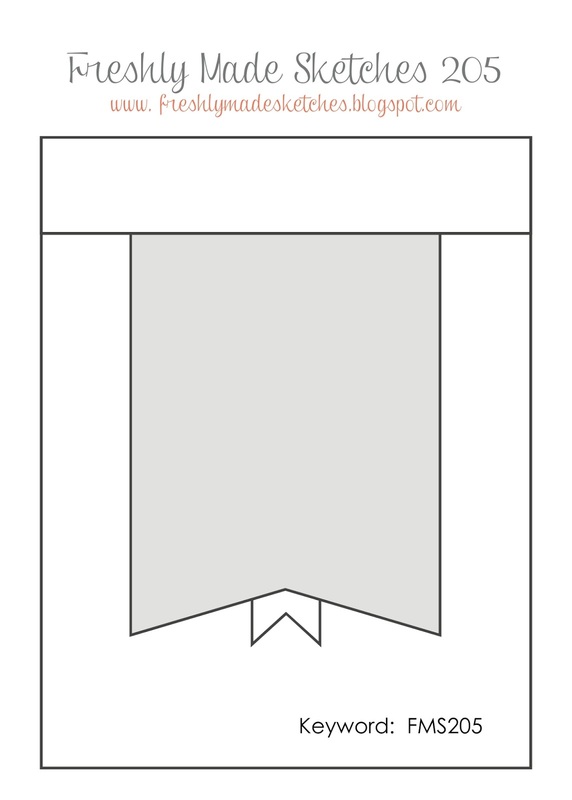 I use a couple of pieces of the gorgeous SU Winter Wonderland Designer Vellum Stack for the top and bottom and I cut a strip of the gold part from a piece of scrap to accent the banner, I just couldn't waste this small piece. The sentiment is from SU teeny Tiny Wishes , I heat embossed in gold. I hope you like this card, leave me your comments and questions, if you have any, I will be happy to answer them. This is the sketch that inspired this card. I hope you give it a try. Till next time, happy stamping. Hello Everyone: Today the fabulous artists at the Pals Paper Arts challenge blog have a fun and fabulous sketch to play with. Here's the card I made with it. This sweet image is from Penny Black and it's called Baby Hammock , I actually bought it at Hobby Lobby with a coupon but I couldn't find this particular stamp on their on line store. The image is stamped on Canson water color paper and colored with my SU markers, Old Olive, More Mustard, So Saffron, Basic Gray, Regal Rose, Elegant Eggplant and Chocolate Chip. The flowers are stamped onto water color paper with Hello Honey using the SU Petite Petals stamp set and punched with the coordinating Petite Petals Punch , I used my aqua painter to give them some color. The little pink hearts are punched with a retired SU heart punch. Here's a close up of this cutie pie of a Hedgehog Baby. And here is the PPA sketch that inspired this card. I just made it horizontally. I hope you like this card, please leave me your comments and questions, I will be more than happy to answer them. Thank you so much for visiting, till next time, happy stamping. 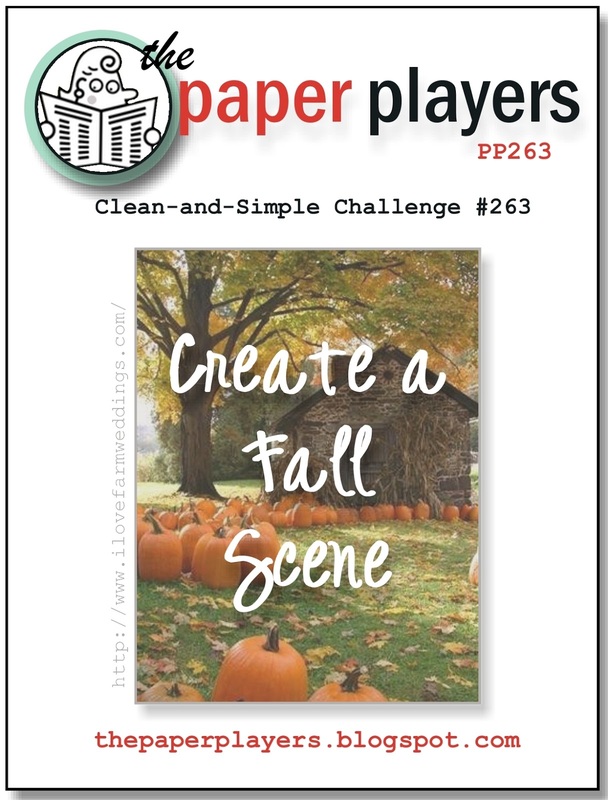 Hello Everyone: This week over at The Paper Players Laurie Schmidt has a fabulous CAS challenge for us this week to play with. 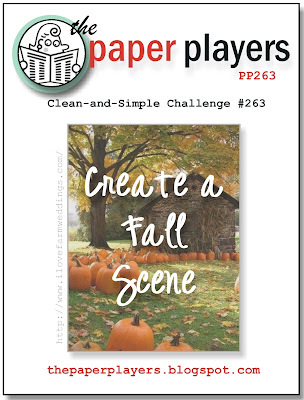 The theme is to create a Fall Scene.....Love It!!! Autumn is my favorite season of the year so I was more than happy to create and share this card with you today. 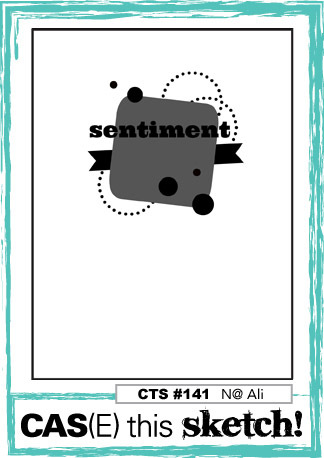 I'm mixing the brand new and gorgeous Stampin Up! Woodland Textured Impressions Embossing Folder with a very old, 2009 Stampin Up! stamp set called "Scene in a Garden", I used each of the 7 images from this set to create this little Fall Scene, I'm sure you'll agree that they are simply beautiful. Back in 2009, all the sets were mounted in wood so I used my Stamp-a-majig to position each image just right. Here is a close up of the beautiful birch trees embossed in the background and of the cute boots, terracotta pots and everything else on this card, the bird is perched on the stem of this pumpkin, thank goodness for my stamp positioner. I sponged a little bit of Hello Honey ink on the trees, the images are stamped on Canson water color paper with Stazon Jet Black ink and colored with my SU markers and the aqua painter. I used Pumpkin Pie, More Mustard, Cajun Craze, Old Olive, Garden Green, Tempting Turquoise, Chocolate Chip, Soft Suede, and a little bit of my silver gel pen for the gardening tool. I tore the paper diagonally to get this pretty edge, I sponged a bit of Tangelo Twist on it to give it some dimension and separate this panel from the embossed panel in the back. Here is the image that inspired this card. I hope you like this card, please leave me your comments, if you have any questions, I will be more than happy to answer them. Thank you so much for stopping by, till next time, enjoy the glorious color of Autumn and happy stamping. Hello Everyone: This week at the Less is More Challenge Blog, the fabulous Designer Team gals came up with a challenge that really made me think and think about how I was going to come up with a card to participate in it.....the theme was TECHNOLOGY!!!!! Now, this is a word that stops me in my tracks, my friends, I think I'm the most technologically challenged grandma around, when my computer coughs, I panic!! if it freezes, I panic!! I've written letters to my friends and push some key (entirely by mistake) and the entire text vanishes into the depths of cyber space, never to be seen again. To me, it's a miracle that I'm able to have this blog and that I've learned to "copy and paste" stuff, upload a picture, provide a link, etc. I have dear friends who have instructed me on how to go about this stuff and for that, I thank you!! This just goes to show you that you can indeed, teach an old doggie new tricks. So, this is my card, and it totally represents how I look at this marvelous machine, when it gets sick. This darling little image is from a super old but totally cute 2009-2010 SU stamp set called "Lots of Bots", it has the cutest little images of robots, this one in particular didn't have it's leg chopped off, I did that myself to make a card for a dear Triathlon friend who had a bad accident on his bike and broke his left leg, he loved the card, he still has it, LOL!! this happened back in 2011!! I highlighted the ERROR word in green, I think that is how some old calculators used to tell us that we messed up or something. I love the Binary Code lines, I must confess that I have no idea what those 0s and 1s mean, or what they are for, I think I don't want to know either, if someone would explain it to me, I will probably have a dazed and confused look on my face. I wish my computer would say it's sorry for what it does to me sometimes, that would be nice. So I hope you like this very CAS card, I'm grateful to have this technology that, even if I can't fully understand it, I'm enjoying it fully. Here's the word that inspired this card. Till next time, keep on stamping and keep enjoying all of this techy stuff. Hello everyone: Today is an extraordinary day for me, because a Christmas card I made for the Merry Monday challenge blog on September 1st. was picked as a winner!!! So it's my joy and privilege to share this card I made as your guest designer for this week's challenge. This challenge called for creating a Christmas card using water colors and I couldn't be happier. Water coloring is my favorite medium to color my images, using my SU markers and an aqua painter. This markers are just so perfect for this, they blend and shade your images beautifully. Here is a close up of this lovely paper. I colored this image with my SU markers in Cherry Cobbler, More Mustard, So Saffron, River Rock, Old Olive and Garden Green. I added some Wink of Stella shimmer to the bells, I hope you can see it, sometimes it's difficult to photograph. The sentiment is from a retired SU set called "Hand Penned Holidays", the font on this set is just so beautiful, I wish my hand writing look like that, I heat embossed it in gold on a piece of Vellum and attached it to the panel with 4 gold brads. I hope you like this card, please leave me your comments and, if you have any questions, I'm here to help. This is the banner that inspired this card. Till next time, hugs from Maria. Hello again: I have another card/tag to share with you today to participate in the Tag You're It! challenge, the theme is Cupcakes, yum!! here is my card. This image is from Power Poppy's Short Stacks by the amazing Marcella Hawley , her designs are so beautiful, I just love all of them. I stamped the image onto a 2" strip of Canson water color paper and punched the tag with my SU Scalloped Tag Topper Punch , I love it! I colored it with my Stampin Up! markers in Cherry Cobbler, More Mustard, Olive Green, Elegant Egg Plant, Tempting Turquoise, Chocolate Chip, Certainly Celery, Pumpkin Pie, Regal Rose and Bashful Blue. 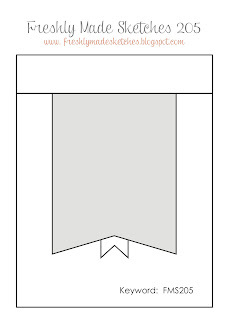 The pattern paper and card stock are from Hobby Lobby. 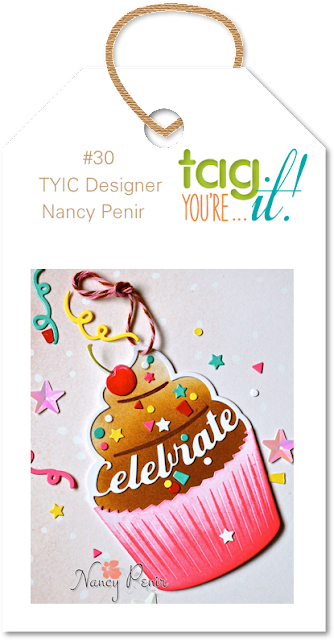 This is the tag, by Nancy Penir, that inspired my card. I want to thank you for visiting, I love to read your comments and if you have any questions, please don't hesitate to ask me. Hello everyone: Today I'm sharing a very CAS card with you that I made to participate in the fun CAS(E) this Sketch! challenge. I'm having a great time making CAS cards, I don't know why I waited so long to give this classy style a try, I love it!!! Here is my card. I hope you guys are not getting tired of me using my Flourishes stamps. When this company was alive and well, I purchased a lot of their beautiful stamp sets, I just couldn't help it, then just about 2 years ago, they closed their doors, a very sad day for a lot of us who loved them, but I was happy that at least, I had a good stash of their stamp sets and this image is from one of them, this one is called "Friendly Reminders". I stamped it onto a panel of Canson water color paper with Stazon Jet Black Ink and colored with just the SU More Mustard marker for the hat, the Chocolate Chip for the hat hanger and just a little bit of my Lost Lagoon ink pad for the ribbon and the sentiment, that's it! The rings around the image were done with the fine tip of my SU markers in Tempting Turquoise, Regal Rose and Old Olive, I put a few Rhine Stones around to follow the sketch. This is the sketch that inspired this card. I want to thank you for visiting, leave me your comments and, if you have any questions, please don't hesitate to ask.